We took it a bit easy after our 17-day Langtang / Gosainkund / Helambu trek. We spent a few days in Kathmandu at Pema's house, then took a 7 hour bus ride to the only other real city in Nepal, Pokhara. Pokhara is on the shores of Fewa lake, which can be quite picturesque in the right conditions. Unfortunately, it's actually at a lower altitude than Kathmandu so it also gets its share of smog. 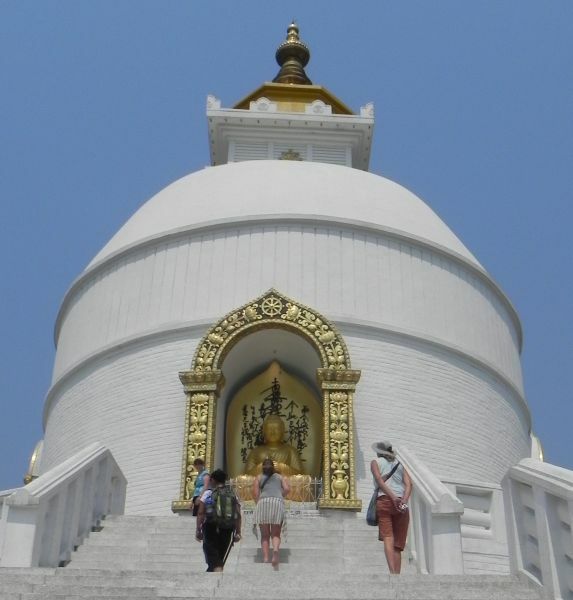 But we walked around the lake and up the hill to the World Peace Pagoda for some nice views of the lake and town, as well as just a hint of Machhapuchhare (Fish Tail Mountain) and the Annapurna range. 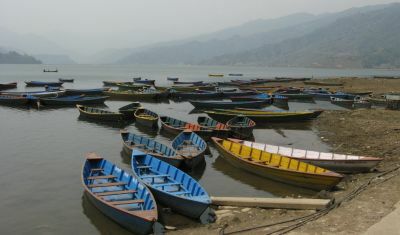 We also had fun with the many good-quality (and inexpensive) restaurants in Pokhara. Pizza? In Nepal?!? One morning we got up in the dark, drove for an hour, then hiked for 45 minutes to the top of a local hill for more views of the mountains. When the mountains did finally come out, they were stunning, extending for perhaps 1/3 of our vista, from Dhaulagiri in the west, past all 5‑6 of the Annapurna peaks, to Manaslu, Himal Chiuli and Ganesh Himal in the east, with Machhapuchhare reigning over them all (actually a lower peak but closer to Pokhara so it looks bigger). From what we've seen, the Maoists seem to be just bullies. They were going from house to house, banging on doors and demanding money. They tried to extort money from the private schools and successfully closed most of them down after burning some of their busses and beating up a principal. We watched several Maoists go up to a fruit‑seller pushing his wares on an old bicycle, pull several fruits out of his baskets, and walk off laughing at the poor man's requests for payment. 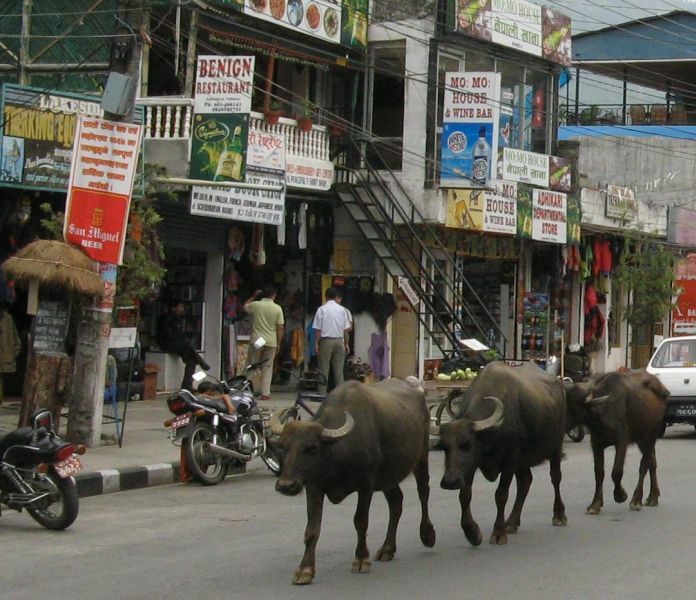 On May 2nd they absolutely shut down Kathmandu by setting up roadblocks and preventing all mechanized transportation. If you approached on a motorbike, or even a bicycle, the Maoists would smash your bike. Our guide watched it happen. Seems a strange way to win the hearts and minds of the masses. But more to the point, Nepal is full of entrepreneurs! Most of them are pretty poor by world standards, but they're all out there working as hard as they can, hustling for a buck. Apparently, nobody told them that communism means that NObody gets ahead (well, except the leaders). Unfortunately, I can't understand the Maoist speeches so I don't know what platform they're trying to use or what they're promising to the masses. Obviously it's not right for the Maoists to not tell the full story. But I suppose politicians are always trying to dupe the uneducated, especially in the third world. It's the easiest way to get (or stay) in power.